A kids scooter is a definite fun item for your kid, only if you can find the best one your prince or princess! Well, how do I find the perfect one? I’m very new to these & I’m getting confused – Is this what you are thinking? Don’t lie, you are thinking this, if you haven’t bought so many before! Everyone does. Cause there are some terms that come in front while choosing the best scooter for kids which you aren’t very familiar to! 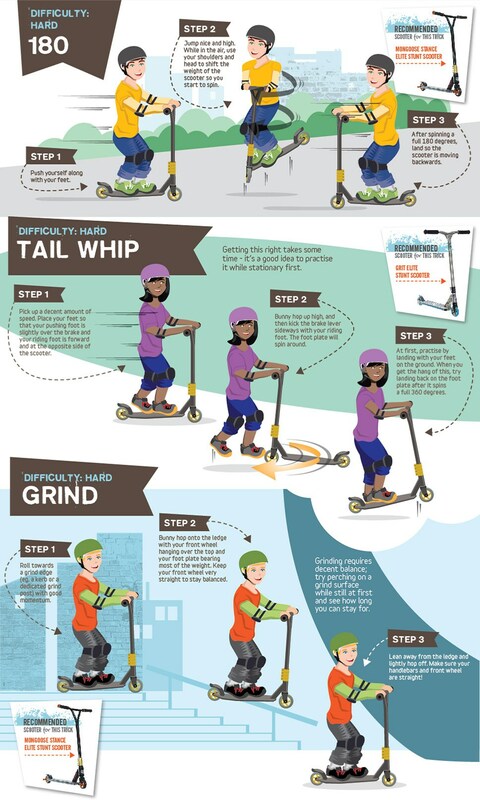 So, the goal of this guide is telling you what things you should consider in the process of buying the best scooter for your kid, and making you aware of some terms that you might face in this process! 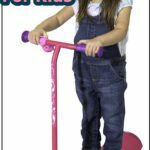 Folding Scooters – If your kid loves a scooter ride to the school, you can pick this for him/her and be a great mom/dad! These are fantastic for kids to ride on during the school run, as these are fold-able and easily portable. So dropping the kids off, you can fold the scooter away and carry it or pop it in the boot easily. Adjustable Handlebars – If you don’t want to buy a scooter every time your kid gains some inches, this can be a smart option. The handlebars of these scooters are adjustable, and thus it adapts with your kid on his or her growing up! So you can get the most out of the scooter till it lasts! Electric Scooters – The modern-day scooters with application of technology in it. The scooters run of motors that are powered by batteries, and it’s a really fun way of getting around! These scooters need charging and they’re pretty fast, can usually reach speeds of around 10mph. So more fun for your kid with a hint of risk as a drawback. Stunt Scooters – If you’d love to see your kid doing some great tricks with his toy, you can buy him these scooters. These are designed for slightly older children and are usually sturdier with clamps and stronger construction to make sure it doesn’t fall apart during a trick. You can judge a scooter wheel from different aspects, like wheel diameter, width, build material and so. Firstly, coming to the wheel diameter, the standard size is 100/110 mm and is found on standard-sized scooters. This is a convenient size for both cruising and doing tricks. You’ll find this size on most of the scooters. Though, there are some specialized sizes to serve a particular purpose better. The larger wheels, with a diameter of 120 mm or more, are specially made for better and comfortable cruising. They need fewer pushes, glides faster on one push and cruises faster than smaller or standard-sized wheels. They also provide a smoother ride as it absorbs the shocks from the bumps and cracks on the pavement better, and they are better for cruising on uneven terrain. The smaller diameter wheels are made for trick loving kids. The main convenience of smaller diameter wheels is they are better for doing tricks. And, the wider the wheel is, the more stability it provides. It’s better for younger kids. 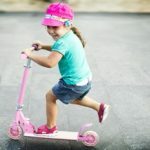 My suggestion: I suggest choosing a scooter with standard wheels, as kids love both cruising and doing exiting tricks. Go for the smaller or bigger wheeled ones only when your kid needs extra convenience for a particular task. Talking about the material the wheel is made of, most of them are made of Polyurethane (also known as PU or urethane). These are durable and offer smoother rides. There are also some that are made of PVC plastic, which doesn’t offer a smoother ride as the PU ones. So, try to go for polyurethane ones. Another term you’ll see is wheel durometer. This indicates to the softness of the wheel. These numbers normally range from 74A to 88A. You don’t need to understand how they’re numbered. Just know the lower the number is, the softer the wheel is. And softer wheel offers a smoother ride, though they tend to wear out faster as well. I’ve bet you’ve seen something like “ABEC-5” in scooter descriptions, and you had no idea what it actually is. Well, it’s a rating to measure the bearing’s performance. It can range from ABEC-1 to ABEC-5. The more the number is, the better the bearing is. ABEC-5 rated bearing is the best for kid’s scooters, though ABEC-3 is decent enough. It’s better to have a wider wheel deck in a scooter. It makes the scooter sturdier and easier for young kids to balance on. A low-to-the-ground deck is also useful for younger kids as it makes things easier to balance on and is safer. Talking about the deck length, shorter decks will be better for smaller children so the deck will not get in the way of their kick path. As kids get taller and older, the length of the deck needs to increase. I guess that’s all you need to keep in mind while looking for the perfect scooter for your kid. If you still have any question or feel that I’ve missed something that I should cover, feel free to ask. I’ll be happy to write for you. Is my child ready to ride a kick scooter?